From left: USGS aerial photographs (not to same scale) of Protection, Coldwater and Wilmore, Comanche County, Kansas. This page was originally constructed with links to satellite images of the county, but, unfortunately, such dynamically-generated pages don't persist for long, so it isn't (I've learned) worthwhile to link to them. Therefore, the links on this page are to either USGS aerial photos or to sites where you can search for current satellite images. Microsoft's TerraServer USA site is one of my favorite sites on the internet, and it was fun to find the Ferrin farm online when the Comanche County, Ks, area had just been added to the database in January of Y2K. If you or your family are from Comanche County, and you could find your way to your family farm by following a road out of town, then you'll be able to find that farm on TerraServer. The speediest way to search for a location is to load the low resolution images at a small picture size while following roads to where you're going, then to zoom in on a location of interest before selecting the large picture size. Be sure to bookmark that picture when you find it, because you can provide a link to it from your postings on the RootsWeb Comanche County boards. If the following links are "broken", go to the TerraServer USA home page to search for images of the area of interest to you. USGS Topographical Map of Comanche County, Ks, 01 July 1980 on TerraServer Here's a link to the interactive topographical map of the area, click on the area of interest to zoom in on it. USGS aerial photo of Protection This image was made 26 Aug 1991 and is 4-meter resolution, meaning that 1 pixel on your screen equals a 4 meter square area of the earth. You can click on areas of interest to "zoom in" on the photo. TerraServer USGS aerial photo of Coldwater, Ks, 01 April 1996 The following link is to a U. S. Geological Service (USGS) aerial photo of Coldwater, Comanche County, Kansas, 01 April 1996, at 8 meter resolution, meaning that each pixel on your screen shows an area 8 meters square. Click on areas of interest in this photo to progressively zoom in to see the image in 8-meter, 4-meter and 2-meter resolution. Click on the green arrows on the sides of the image to view the image in that direction. TerraServer USGS aerial photo of Wilmore, KS, 01 April 1996 The following link is to a U. S. Geological Service (USGS) image of Wilmore, Comanche County, Kansas, 01 April 1996, at 2 meter resolution, meaning that each pixel on your screen shows an area 2 meters square. You can also navigate the TerraServer site to see the image in 16-meter, 8-meter & 4-meter resolution. Click on the green arrows on the sides of the image to view the image in that direction. At left: image from Heavens-Above.comof the passage of the International Space Station in relation to Wilmore, Kansas, on 08 Feb 2004. Heavens-Above.com is, without a doubt, the most fascinating "satellite website" on, above or about the face of the earth. 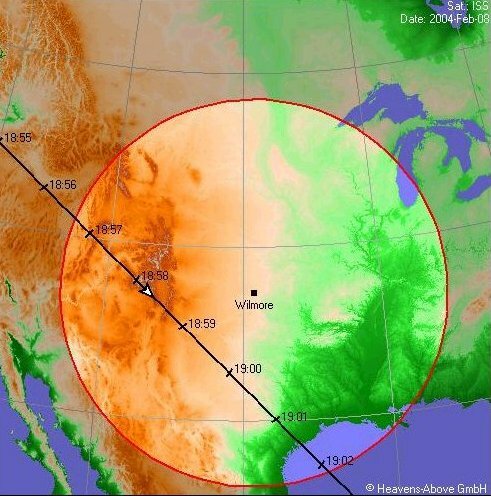 "The highlighted circle (at left) is the region where the International Space Station satellite is at least 10° above your horizon. The size of the circle depends on the height of the satellite. Solid part of orbit shows where the satellite is sunlit, and the dashed part where it is in the Earth's shadow and invisible. LightningStorm.com Ok, it isn't really a satellite image because the sensors are ground-based, but this is a site which shows a map of the USA with recent lightning strikes documented by time and place. The "cool factor" of this site is electrifying. Click on the link for "Free Lightning Map" to see the map: "Lightning Explorer, a free online lightning map, tracks recent thunderstorm movement and lightning activity on a map of continental U.S using your web browser. Lightning activity is delayed by 30 minutes and can be refreshed every 30 minutes. " Satellite Images of "Tornado Alley"
Autumn Twisters Rip Through Midwest "On October 9, 2001, the Storm Prediction Center issued a "Moderate Risk" warning for severe storms to occur over portions of the Central and Southern Great Plains region of the United States. This warning prompted Colorado State University's Cooperative Institute for Research in the Atmosphere (CIRA) to initiate super rapid scan operations of the GOES-12 satellite to collect images over the region at 1-minute intervals. Residents of Oklahoma, Nebraska and Kansas didn't know it at the time, but they would be hit by a series of tornadoes sweeping through portions of those states later that day. This page was last updated 08 February 2004.